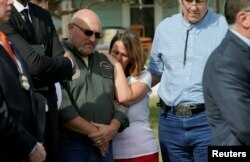 A gunman in Texas shot and killed 26 people in a church in the small community of Southerland Springs, Texas on Sunday. At least 20 people were injured in the shooting. Victims included children and the elderly. The suspected gunman is also dead. The event comes weeks after another major mass shooting in the United States. On October 1, Stephen Paddock shot and killed 58 people at a concert in Las Vegas, Nevada and wounded about 500 more. It was the worst mass shooting in modern U.S. history. In both events, the reason remains unclear. The police and the public search for answers. Jeffery Simon, an expert on mass killings, told CNN that wanting to know why someone would commit such a terrible crime is natural. It is hard to get an answer, however. Public safety official Freeman Martin identified the gunman in Texas as 26-year-old Devin Kelley. Martin described him as a white male wearing a bullet-proof vest. Reports say he opened fire with an assault rifle outside of the First Baptist Church, entered and continued shooting. The names of those killed have not been officially released yet. However, many people in the church knew Kelley. Devin Patrick Kelley, 26, of Braunfels, Texas, involved in the First Baptist Church shooting in Sutherland Springs, Texas, is shown in this undated Texas Department of Safety driver license photo, provided Nov. 6, 2017. While Kelley was shooting, a local person with his own rifle approached the gunman. This caused the gunman to drop his weapon and flee in his vehicle. The citizen reportedly chased the gunmen. Police then joined in pursuing the suspect. The suspect crashed and was found dead in his vehicle. Officials say he shot and killed himself. Police have not found any links between Kelley and an organized terror group. They say that his criminal history with the police includes only minor driving violations. However, a spokesman for the U.S. Air Force told VOA that records show Kelley was discharged from the Air Force three years ago. He was charged with assaulting his wife and their child. The couple divorced. Two years later, Kelley married again. It is unknown whether he and his second wife are still together. Pastor Frank Pomeroy, with his wife Sherri, listens at a news conference outside the site of the shooting at his church, the First Baptist Church of Sutherland, Texas, Nov. 6, 2017. So, why did he do it? Texas Governor Gregg Abbott said the shooting was the worst in the history of the state of Texas. He added that law enforcement officials had “many pieces of a complex puzzle” to put together about the events. Examinations of previous mass shooting events have linked a number of issues to such violence. 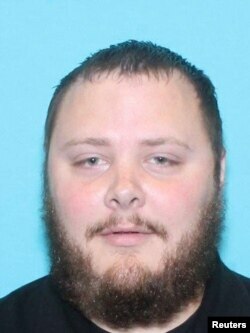 In the case of the Texas shooter, reports say that Kelley had a troubled relationship with his mother-in-law, who attended the church. But Katherine Ramsland, a professor of forensic psychology at DeSales University, has cautioned against identifying a motive too quickly. She points to the mass shooting at Columbine High School in 1999. In that event, two students killed 12 classmates and a teacher, and wounded more than 20 other people. They then killed themselves. After Columbine, Ramsland says, the media used the information they had to offer an explanation that was not complete or proven. Later studies of the event found more complicated reasons. In general, experts agree that a single event usually does not cause a person to take violent action. Instead, many things can be involved over a long period of time. 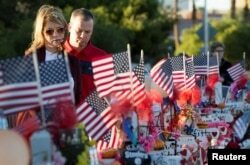 A couple looks over 58 wooden crosses, with the names and photos of the October 1 mass shooting victims, in the median of Las Vegas Boulevard South near the "Welcome to Las Vegas" sign in Las Vegas, Nevada, Oct. 9, 2017. The lack of a single – or simple – explanation has been a hallmark of the Las Vegas shooting in October. The gunman did not seem troubled by money or romantic relationship problems. And the public is still struggling to understand the mass shooting at Sandy Hook Elementary School in 2012. In that event, a 20-year-old man shot and killed 20 children and 6 adults before committing suicide. A report from state officials confirmed that the Sandy Hook shooter had mental health problems. But it did not identify a reason for the crime. Writing in Time magazine, Ari Schulman has said that the lack of a reason defines violence against a large number of strangers. “The mass shooting is a crafted public spectacle, a theater of violence,” Schulman wrote. Its aim is to cause a public reaction, and to bring attention to the shooter – even if the attention is negative, Shulman said. And the victims are more than the people who are struck by the bullets. The guns are aimed at society itself. Kelly Jean Kelly adapted this story for Learning English, with reports from VOA News, CNN, CBS, NBC, Time, and Psychology Today. Mario Ritter was the editor. What Do Mass Killers Have in Common?